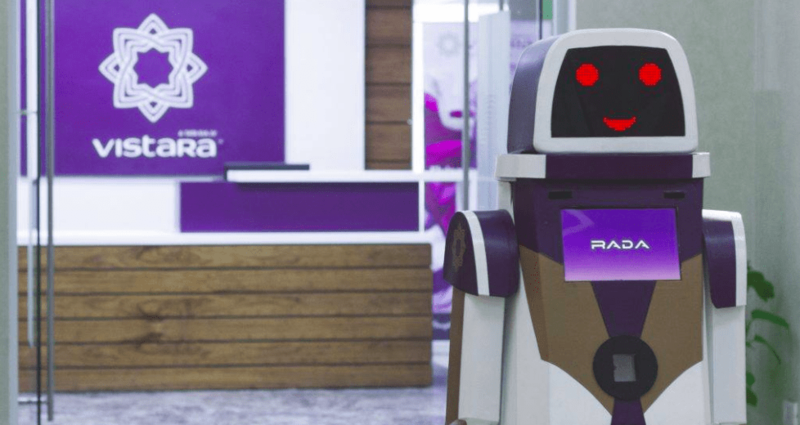 In a bid to automate simple tasks and improve customer experience, Vistara, a joint venture between Tata Sons and Singapore Airlines, has created a unique artificial intelligence-based robot called RADA. According to a statement released by Vistara, the RADA will be placed at Vistara’s Signature Lounge at Delhi’s Indira Gandhi International Airport’s Terminal 3 from 5 July 2018 to assist customers before they board their flights. RADA will be further developed over a period of time in terms of functionality and features for future use cases, after gauging customer feedback. RADA has been envisioned and incubated under Vistara’s Innovation initiative. It is conceived, designed and engineered by its team of technology experts and apprentices from Tata Innovation Lab with support from students of reputed institutions. Built on a chassis of four wheels, RADA can rotate 360 degrees and has three inbuilt cameras for cognitive interaction. Combining these components with an effective voice technology, Vistara has developed the robot to provide a simple solution to cater to the emerging and future trends. But this is not the first time that an Indian airport has featured a humanoid bot for customer assistance. Earlier this year, Priyank Kharge, Minister of State for Information Technology and Tourism, Government of Karnataka, unveiled KEMPA, a bot created to help customers at the Kempegowda International Airport in Bengaluru. KEMPA was been built by Bengaluru-based Sirena Technologies, a startup which has benefited from government initiatives. Interestingly, humanoids and chatbots have been gaining popularity in India for quite some time now. Last year, the indigenously made robot Mitra was a part of the Global Entrepreneurship Summit held in Hyderabad and had welcomed Prime Minister Narendra Modi and Ivanka Trump, First Daughter and advisor to the President of the United States Donald Trump. Interestingly, Mitra has also been built by a Bengaluru-based startup named Invento Robotics. In 2016, Lakshmi, an Artificial Intelligence-powered robot had made its debut on the big stage at the City Union Bank based in Chennai, Tamil Nadu. The humanoid was introduced by the bank to deal with the humongous number of customer queries.